After de-committing from Ohio (the green one) and visiting Michigan's campus, Caris LeVert has decided to commit to Michigan. 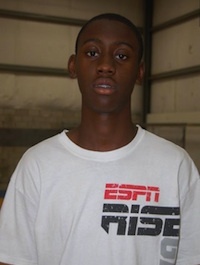 He is a class of 2012 recruit and ranked as a 3* by Rivals and a 2* by ESPN. He is a 6'4" guard that weighs 175 lbs and will probably be playing SG at Michigan, although I think there is a chance that if needed, he can play another somewhere else. He was originally projected to commit on Wednesday, but delayed his decision to Friday. Almost everybody projected him ending up in Ann Arbor because he should be a great fit in Beilein's system and has connections with the school. He currently attends the same school as 4* defensive end Taco Charlton and I don't think anybody doubts that this was at least a factor in his decision. If there is a recruit in this year's class that is under the radar, it's LeVert. He has not received much love from the recruiting services and is not going to be hyped like other Michigan recruits such as Mitch McGary or Glenn Robinson III, but I see no reason why he won't perform well once he arrives next fall. He has some great skills and was also being recruited pretty heavily by some other Big Ten programs like Purdue. He probably won't contribute a ton early just because of Michigan's immense depth over the next few years, but I think he could be a big factor for Michigan. He's one of three guards selected in the 2012 recruiting class for Michigan (the others being Spike Albrecht and Nik Staukas). Staukas will likely be playing the same position as LeVert, which is a major reason I'm not sure how much of an impact he will have for the team early, but both of them could easily play on the floor together. Now, just because LeVert hasn't received a ton of love from the recruiting sites doesn't mean he's not talented. He not only led his team to the state championship while averaging 19 points per game, but also won Ohio's prestigious JJ Huddle Player of the Year Award. The previous winners include players such as Trey Burke, Jared Sullinger, and William Buford. Obviously, winning the award puts him in good company and remember, Trey Burke didn't receive a lot of love either as an incoming recruit. Overall, this is a solid pick-up for Michigan that fans may not appreciate right away, but is going to be important in the future. The kid can seriously play and I think fans will see that once he gets a chance. As I said, he may not get his chance early, but when he does, I think he's going to impress a lot of people.